Available from Barz Decorative Hardware. Barz Decorative Hardware offers a complete line of retail display boards for wholesale customers. Boards may be organized by design style (ie: contemporary, whimsical, rustic, etc.) or for a limited time, on specialty boards which display a selection of all design categories on a single board (as shown above). Click here to get a closer look at all our display board options! 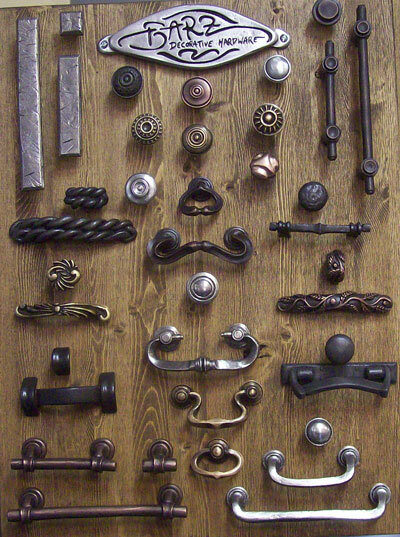 Our hardware is cast in lead free pewter. Every piece is available in a variety of finishes. We design and manufacture all products in Silverton, Colorado. Our products are environmentally and economically responsible. All pieces available in 22 different finishes. You have the option of hand picking pieces for your board or ordering loose pieces to display.